Disneyland’s new Star Wars: Galaxy’s Edge has fans counting down the days until the grand opening this summer. 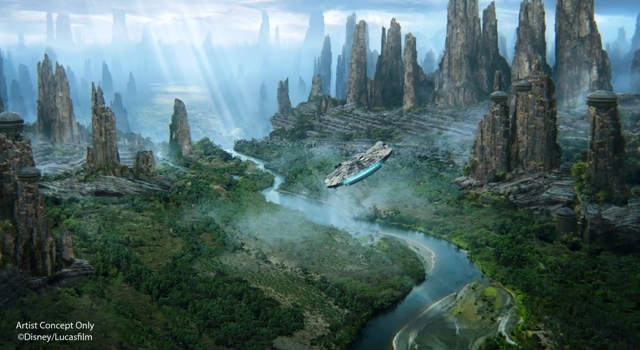 Guests from across the galaxy will be transported to the remote planet of Batuu to experience this larger-than-life land. Opening day will be May 31st at Disneyland park in California. Star Wars: Galaxy’s Edge will open at Disney’s Hollywood Studios at Walt Disney World Resort in Florida on August 29th. Batuu is on the frontier of Wild Space and home to the Black Spire Outpost, an infamous port for traders, smugglers and adventures wishing to avoid entanglements with the First Order. Walt Disney Imagineers have created another masterpiece, blending the latest technology with creative storytelling for truly immersive experiences. Fans are going to feel like they are actually part of the Star Wars story. Spanning 14 acres, Galaxy’s Edge will be the largest land expansion ever at a Disney park. The eagerly awaited Millennium Falcon: Smugglers Run attraction puts guests at the controls of the most famous ship in the galaxy. Take flight and test your critical skills as a pilot, gunner or flight engineer as the ship hurtles through space. This will be spectacular! The second main attraction is set to open later this year. On Star Wars: Rise of the Resistance, guests will be able to join an epic battle between the First Order and the Resistance, including a face-off with Kylo Ren. The thrilling journey takes them inside a full-size starship and aboard a Star Destroyer. This will be the most ambitious and advanced attraction ever imagined. We look forward to exploring the Black Spire Outpost, visiting the bustling street markets and the Cantina, plus encountering creatures and characters that are hallmarks of the Star Wars universe. Academy Award-winning composer John Williams created new Star Wars themes exclusively for the land. This original music was recorded by the London Symphony Orchestra at Abbey Road Studios. An intriguing collection of merchant shops are also in the Star Wars theme. Customize your own lightsaber at Savi’s Workshop-Hand built Lightsabers. Discover fascinating creature at Creature Stall. 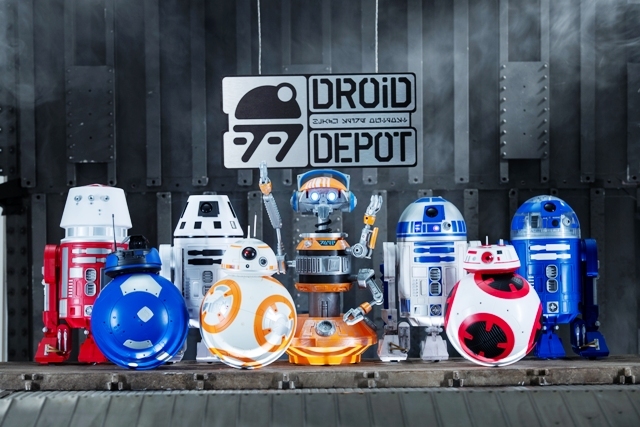 Construct your own R-series or BB-series droid at Droid Depot. Dok-Ondar’s Den of Antiquities offers rare and mysterious items for sale, including ancient Jedi and Sith artifacts, lightsabers and more. The mobile app Play Disney Parks, which debuted last year, offers interactive experiences to bring Star Wars elements to life. Explorers will be able travel though the land using the app to interact with droids and ships, translate a galactic language, and much more. 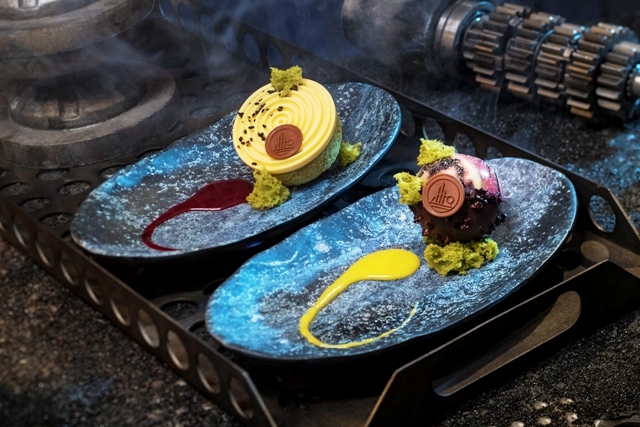 Guests will be immersed in the story of Star Wars as they sample galactic food and beverage with unique ingredients and presentation. In the Black Spire Outpost market, Ronto Roasters will certainly draw plenty of attention with the large pod racing engine firing up a barbeque pit for tasty Ronto Wraps. We can’t wait to sample a Tatooine Sunset or Sour Sarlacc, one of a variety of non-alcoholic drinks found throughout this land. At Oga’s Cantina, patrons can enjoy exotic beverages while listening to spirited musical entertainment. This is provided by DJ R-3X, also known as Rex, the former Starspeeder 3000 pilot droid from the original Star Tours attraction. Visit the Milk Stand for a frosty glass of Blue Milk or Green Milk. We hear this is actually a frozen smoothie with creamy fruit flavors. Rather than standard popcorn, Kat Saka’s Kettle offers the Outpost Mix, a combination of purple, red, and orange popcorn with sweet, spicy and savory flavors. Travelers may refuel with meals at Docking Bay 7 Food and Cargo. Smoked Kaadu Ribs, Fried Endorian Tip-Yip, and Yobshrimp noodle salad are just a few of the offerings at this stop. If you plan to visit Star Wars: Galaxy’s Edge at Disneyland Park between May 31 and June 23, 2019, please note you will need a valid theme park admission and a reservation in order to be able to access the land. This is subject to availability. More information will be available on Disneyland.com. Guests staying at one of the three Disneyland Resort hotels will receive one designated reservation per guest to access Galaxy’s Edge. This is another reason we choose to enjoy a stay at the classic Disneyland Hotel, Paradise Pier Hotel, or our all-time favorite, the Grand Californian Hotel and Spa. For more details about Star Wars: Galaxy’s Edge visit http://www.disneyland.com or http://www.disneyparksblog.com .